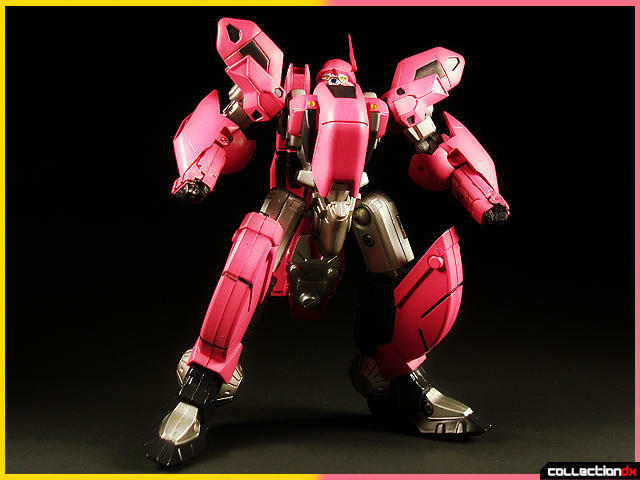 This toy appears courtesy of HobbyLink Japan. CM's Corporation. To many it brings joy, to many it brings grunts. I am the former. You see, CM's corp is like a Sushi Restaurant. You are always hesitant to take an expensive bite of the food just in case you don't like it. Sometimes it may taste nasty, sometimes it's so-so and then sometimes you savor the flavor. 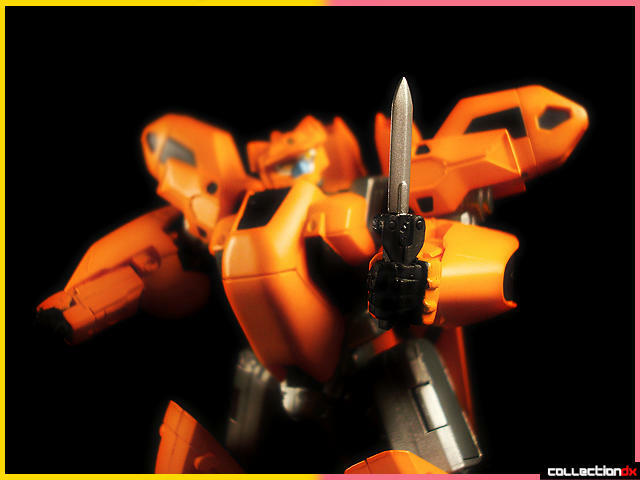 I'm one of the rare folk who enjoy any CM's Brave Gokin release. Sure, they've release some questionable stuff like their Gakeen, but really, I love that release no matter how many quirks it has. They've also delivered some homeruns like Goshogun, Ingram and Gordian. 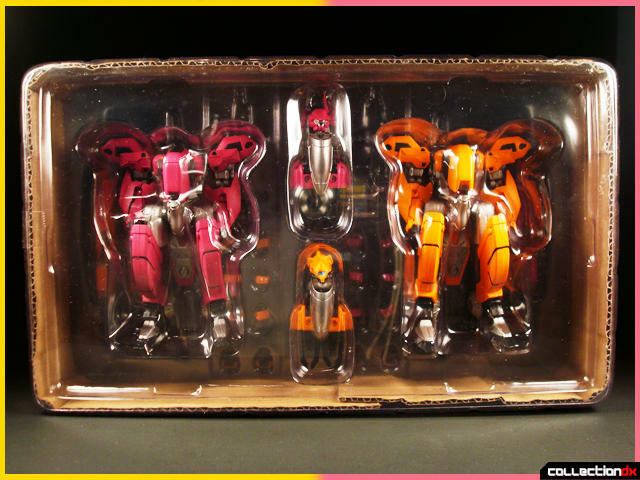 So what we have here is CM's Brave Gokin 32 which comes with two little pieces of sushi ready to be tasted. I was never a big fan of the anime so you wont get a backstory with this but I will go over what you get with this little set. The packaging is standard CM's glossy thin carton with colorful graphics displaying the two figures contained within. If you spin the box around you will see more of the standard CM's graphic layout with crisp colorful graphics. The fun stuff is inside so let's get right to it. 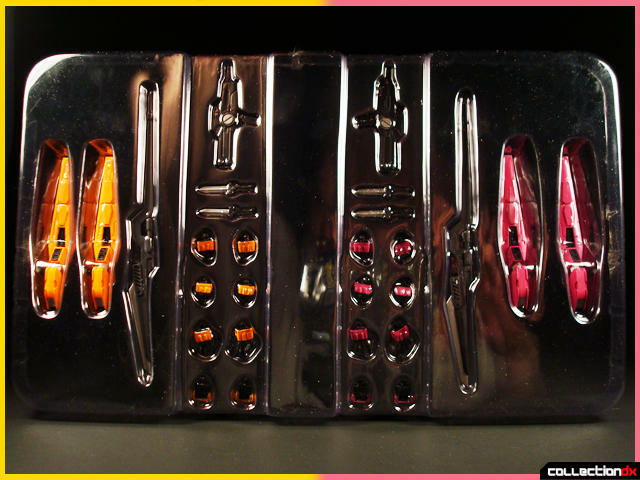 Once you slide out the tray, you'll find a crystal clear vacuum formed tray with lid. 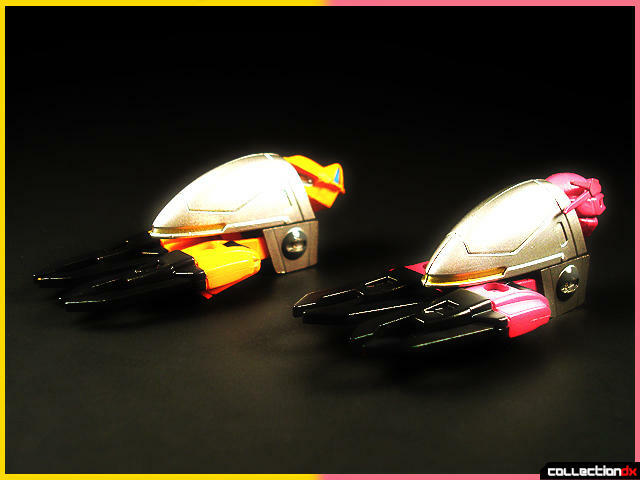 Here you'll be able to see both robots just waiting for some greasy little fingers to pull them out. What's this? Underneath is another tray? What a nice little surprise! Here we have an assortment of weapons, alternate hands and other bits. 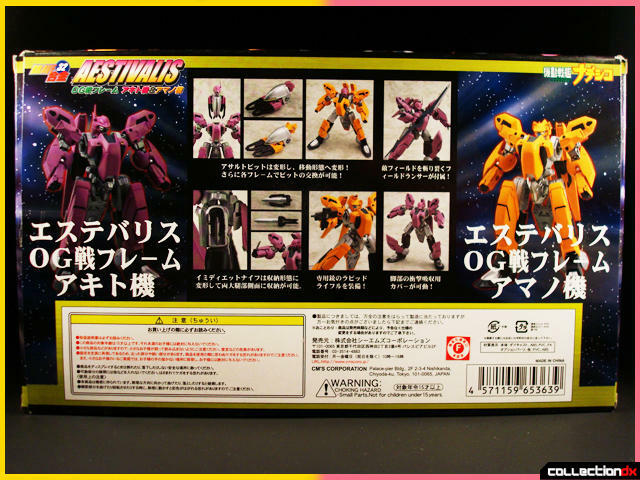 We are going to take a look at the purplish robot first since my wife said it was pretty. 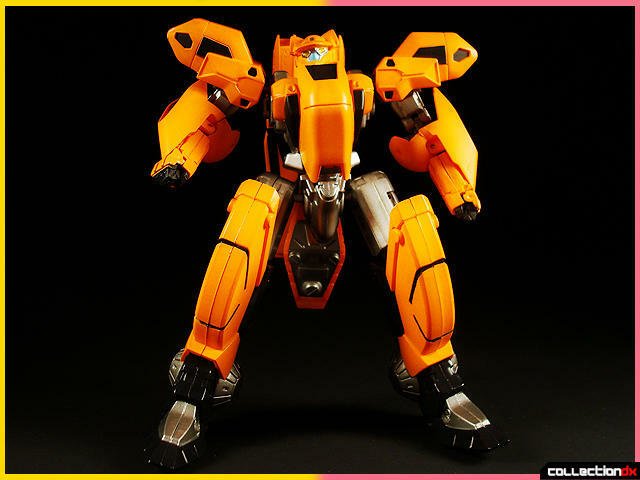 From this point on we will use the proper name for this mech. It's called a "Frame". A Zero G Frame to be exact. 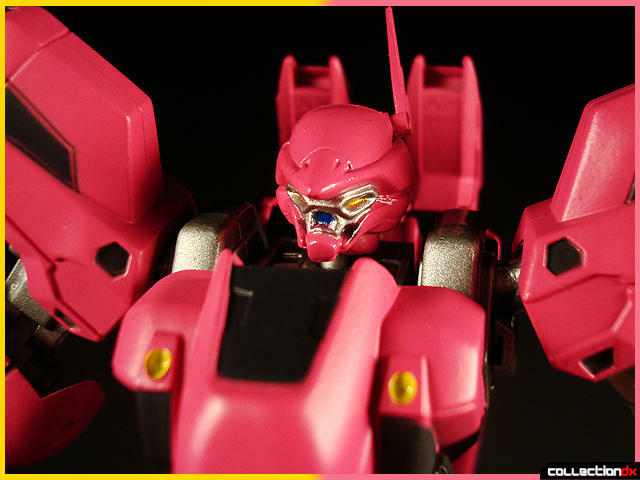 So here is a look at the first Frame: Akito Tenkawa's Zero G Frame. Here the rear view of the Frame with it's booster wings attached. These do not come attached from the box. 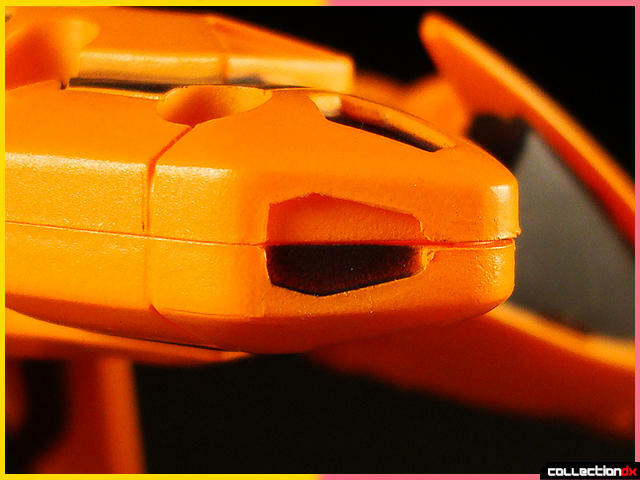 Let's take an up-close look at the Frame's head. Despite this figure's small size, it has a generous amount of detail. I dig figures that pass the Macro test. These guys are somewhat teeny but the paint detail is pretty good. 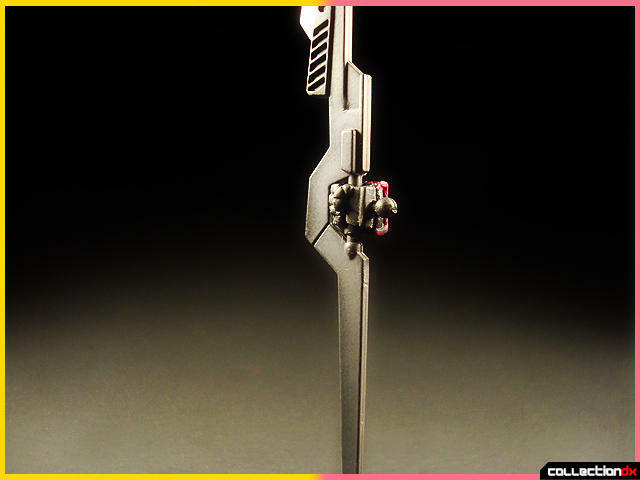 Up next is Hikaru Amano's Frame Unit. It's color is similar to Orange juice on the yellow side. 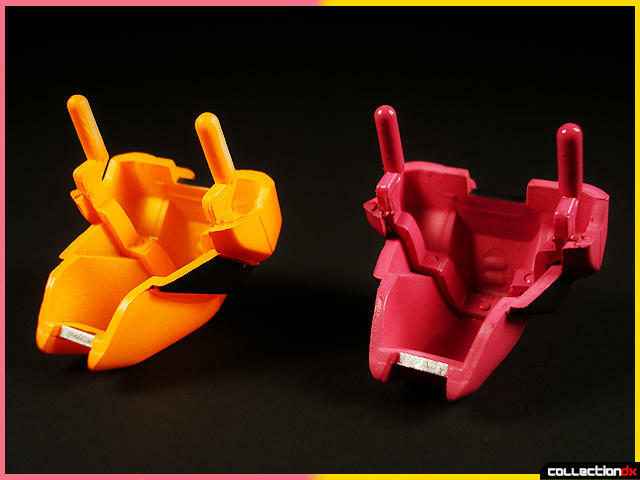 Its basically the same exact mold using another color. 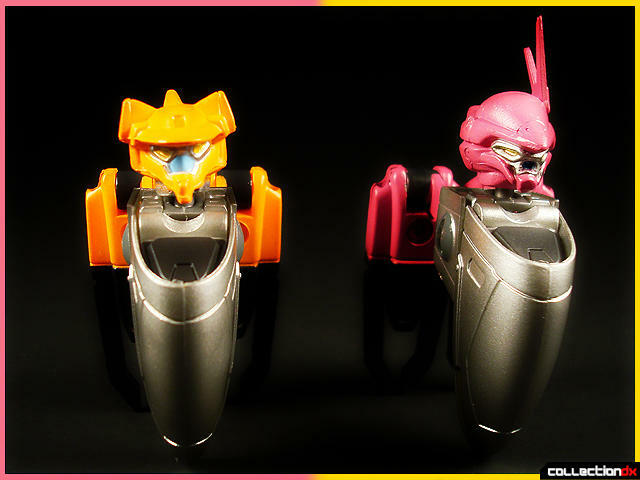 The heads however are different. Here is the rear view with the wing boosters attached. Again, these have to be attached since they do not come attached out of the box. Here we give it the ol' Macro test which it passes with flying colors. Nothing messy going on here. Although paint apps on these figures are nice, I did happen to catch an oversight when black paint was applied to these shoulder vents. Notice only half of it is painted. So what's the deal with these Frames? Well they are exactly that, frames. There are these ships called Assault Pits which convert into the heads of the Zero G Frames. Here they are in ship form. With a simple transformation, they become the heads of the Frames. Here we see the Frames sans arms to get a clear view where these assault pits fit into. 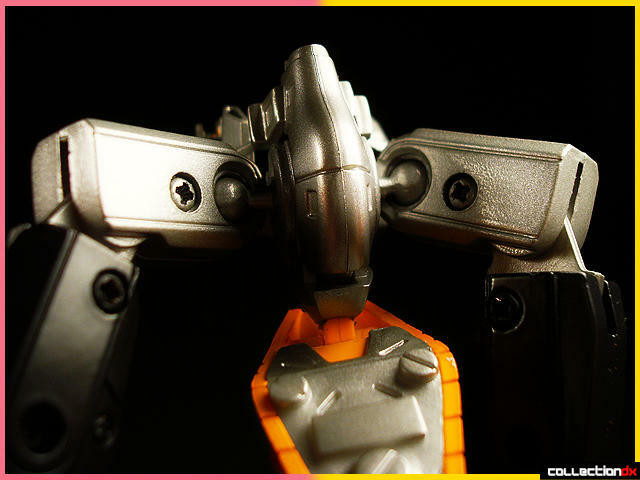 You can also see the shoulder's ball joints. They are plastic caps over a diecast ball. The grey area is pure diecast with a gunmetal paint application. In fact most of this figure is diecast despite its small size. 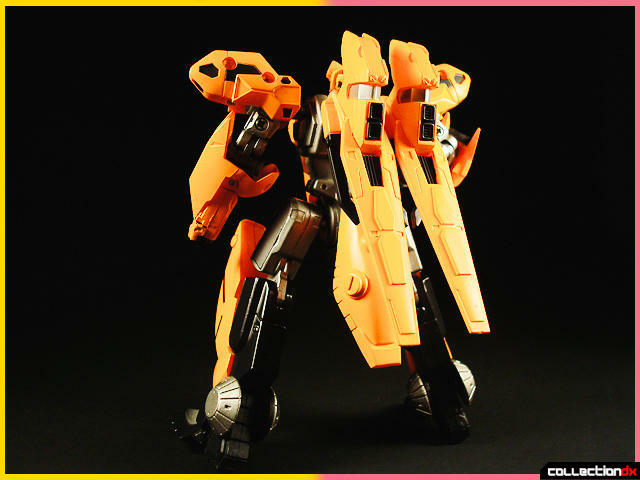 It has definitely earned its "Brave Gokin" designation. I'm not sure what the purpose of this is, but the shin guards pull out. During normal combining, you could leave the arms on. However you would have to remove the chest piece to allow fitment of the Assault Pit. You can also get away with slightly pulling it out. Here we see the chest piece. 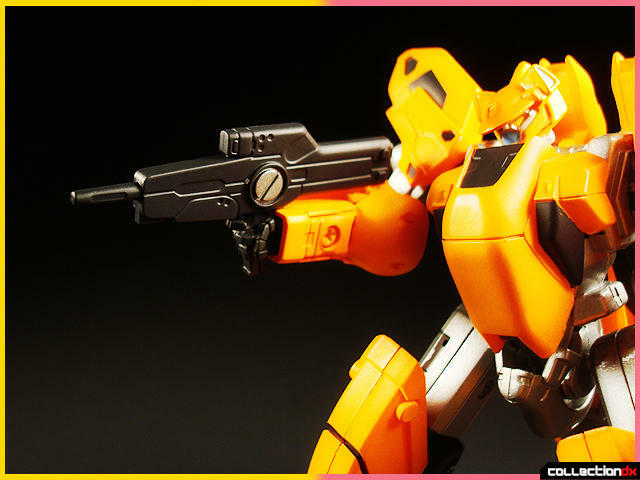 If you've dealt with Brave Gokin Aestivalis releases before, you've either broken or come close to breaking these chest pieces. It seems that after paint is applied, the pins used to attach it to the Frame become difficult to pull out without stressing them real bad...or worse, breaking them. I've modified my yellow piece by filing down the paint so it's not such a tight fit (Fig.1). The purple however did not have this problem on my example. Note: If you find that the pins are not sliding in smoothly, look inside and make sure the hole that the pins go into are aligned correctly. Sometimes they spin out of position. I noticed the pin bracket was a separate piece from the chest piece. I would have appreciated the inclusion of a spare set for each chest piece. That way, if it snapped, you would learn your lesson and have another chance at it. Or better yet, a redesign would have been the proper thing to do. 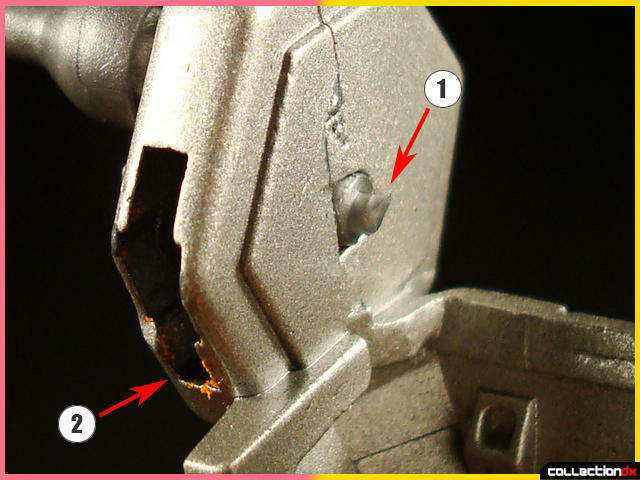 It's possible to avoid breakage, just apply gentle pressure when pulling it out, then file it down. This photo shows how this chest piece is made of two separate components. Either I need better eyes and coordination or the fitment of the Assault Pits is impossible to fit into the Frame properly. In fact I've never properly been able to fit it properly without using super human finger strength. You can just lay it in there for display, but for handling, you really need to snap it in. The assault pits have this glossy dark grey domes on the side that have a slot. 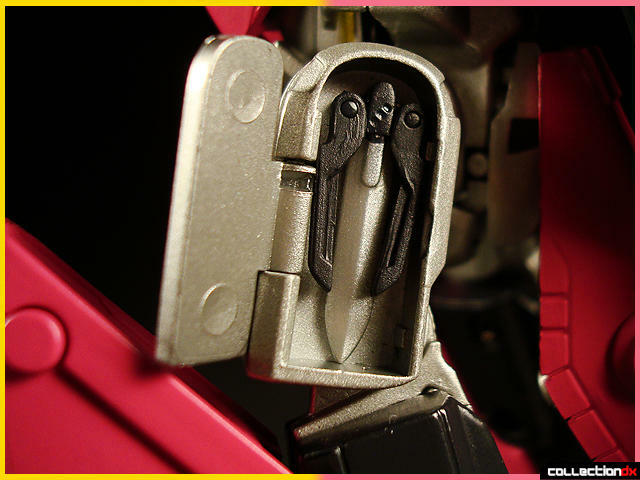 On the Frames there are small plastic nubs or nibs...tiny fingers that slide into the slot. That was the plan at least. After repeated attempts I managed to snap them in only to find out that I was mutilating the teeny fingers and scratching up the paint of the Assault Pits. Here you can see the little "fingers" I'm talking about. They used to be round. Now they are elongated (Fig.1). 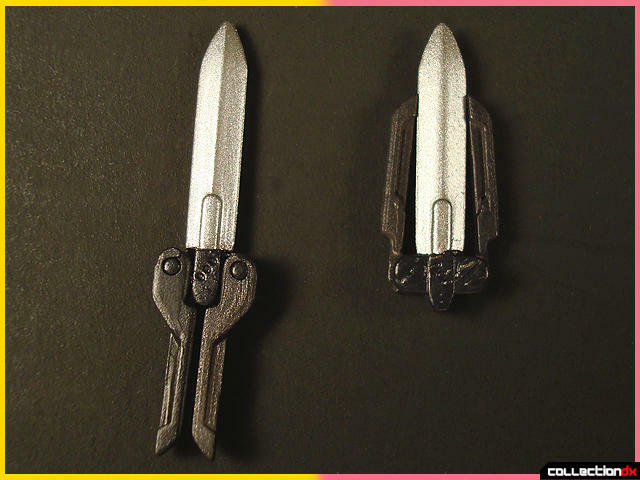 You can also see how the sharp edge of the casting eats away at the chest piece paint (Fig.2) which is not really a problem since you never even see that part normally. 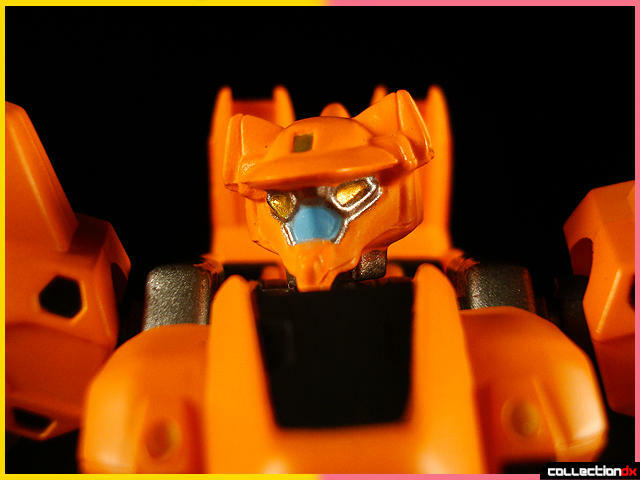 What's strange is that when I noticed those paint chips, the chest piece had no scratches to be found. The paint used is very good. More on that later. 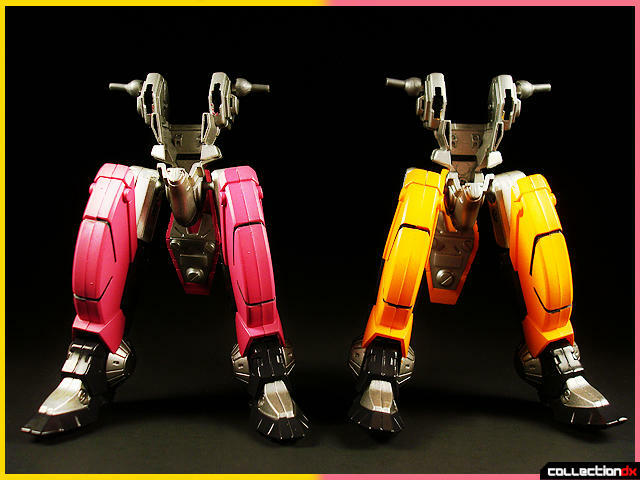 The hips consist of a ball joint design. 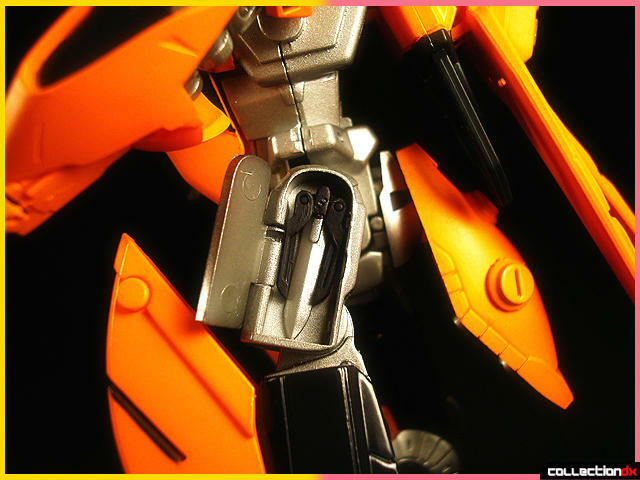 The joints themselves are diecast so they should be durable and provide a wide range of of movement. Ok, so let's move on to the exciting stuff. WEAPONS. Who doesn't love weapons? Well I don't like weapons that take up 3 trays and 80% of the box. This has a comfortable amount of weapons. Just basic stuff. Like this IMMEDIATE KNIFE! How immediate is it? Well it's so immediate that it's stored conveniently in its thigh. It has a precisely molded hinged door. To fit the knife, it must be folded butterfly style. Both figures have this feature naturally. This feature is mirrored on the other leg. Here is an up-close look of the knife design. Also included in this set is the Field Lancer. The Frame looks ready to rock with this weapon. To use the Field Lancer, you need a two-piece fist. 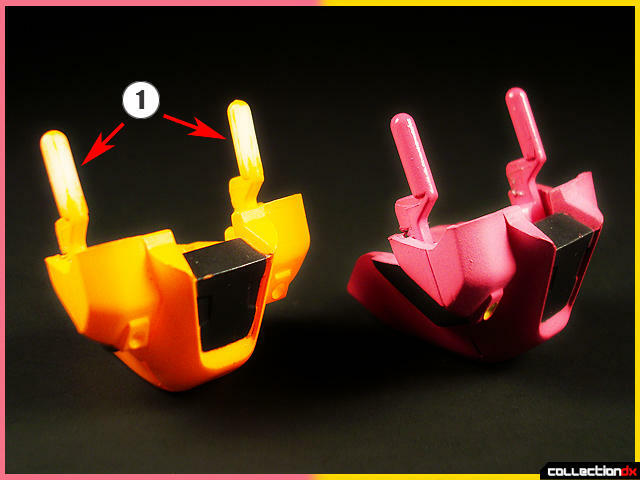 It separates in two allowing each half to go around the grip of the Field Lancer. Once snapped together, you're left with this. When you're ready to roll, you'll need this weapon. Every cool robot deserves a nice blaster. It's use requires an alternate hand supplied with the set. 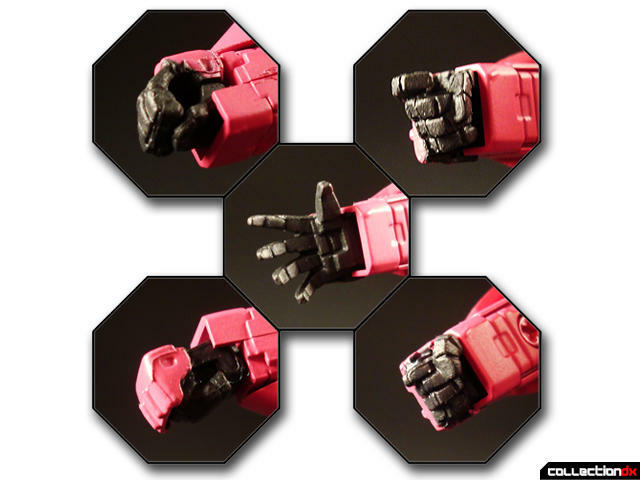 That's pretty much it on the weapons front, so we'll move on to it's accessories which consists of alternate fists. A full set for each Frame. Now, originally this photo was supposed to show you one of the fists in detail- This one that has a form of robotic brass knuckles- however, I want you to take a look at the size of the small machine screw used in the arm. This gives you an idea of how small the figure is. Also notice that the screw has been painted to match. Of note is the crisp detail even under the scrutiny of the "macro test". In standard real life settings using human eyes, it looks just splendid. Ok, so we've looked at everything. What's my take on this set? Well, like I said, it's like sushi, but I won't draw that comparison again. In my experience with it, I grew to like it more as I handled it. I remember having a hell of a time getting it to stand firmly. I couldn't get the heels angled right, so any adjustment made to the heel threw off the angle I just gave the knees. It's only a matter of getting used to it. Another thing I should add is that the arms come off during handling since they attach to the shoulders using a cup ball joint on the Frame side that has a shaft that slides into the arm. 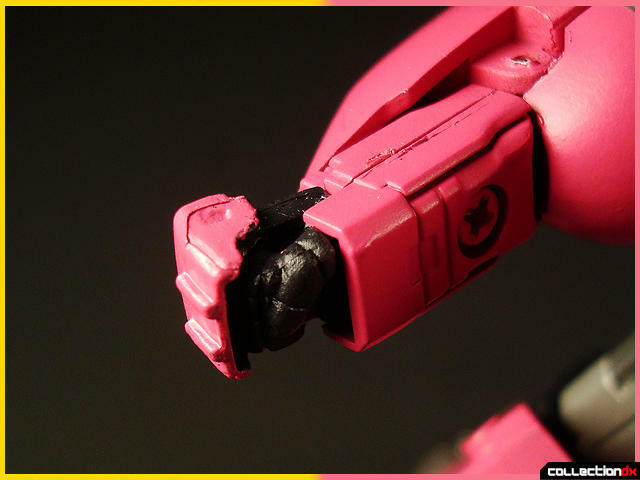 It really didn't bother me but if you find you like to play a lot with your gokin, you may want to tighten that up a bit with nail polish. Oh, I mentioned I would talk about the paint. The paint almost feels like a tough plastic coating ( I guess in essence it is) that is very hard to scratch. 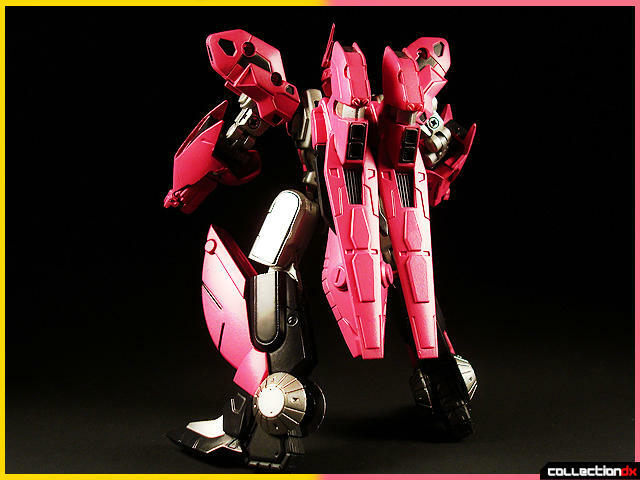 I've seen this paint used on some GFF Gundams, Yamato Valkyrie's and other high end toys. It's hard to explain, but it's tough and hard to chip. In putting in the Assault Pits, I'd lose grip and smash parts to the paint (a sure way to chip paint) but it wouldn't even scratch. More toys should use this paint. This explains why even after the Frame scraped pieces of the chest piece away, it still retained paint without looking scratched. Nice. It's a pretty solid little figure made mostly of the desirable material we call metal. 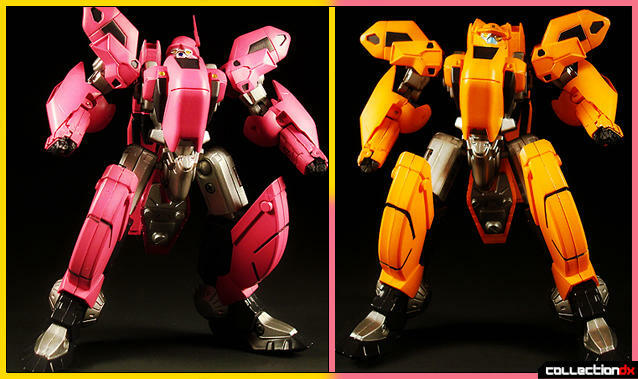 Some may shy away because of its size, but that's why CM's gives you two for the price of one gokin. A very expensive one, but not surprising as CM's Corp is widely known for it's high-end high-price releases. Had they made this a full size gokin, most people would look the other way since there are a wide range of Frames in the anime/manga. Collecting them all would be a very expensive ordeal. Those looking to own all will take relief in the form of a two-in-one package. Oh yes, there are more Frames. 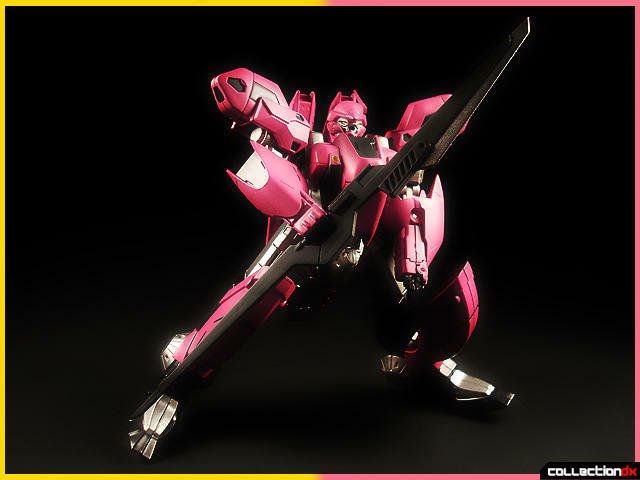 ... however that doesn't mean you can't join the Frame club because you can still get the Brave Gokin 32 I've just reviewed here from the great folks who made this review possible, over at HobbyLink Japan. aside from that a good job. 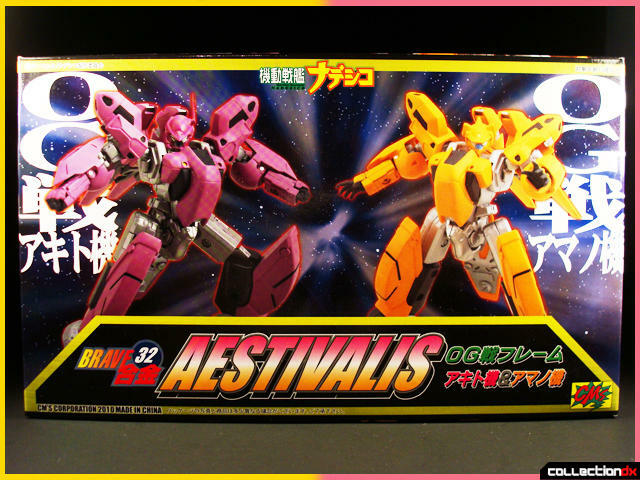 they will be trying on my patience when getting all of those aestivalis, barring from the devil aestivalis, they are mostly one custom unit per person. too bad the anime was kind of shafted by not releasing the games that explained the movie and what happened after the movie. all in all they did make a sequel to the tv series only in a different way but it's amazing how fans want to put down the movie when you can blame video game companies not releasing the games when the anime was kind of popular back in the 90's.